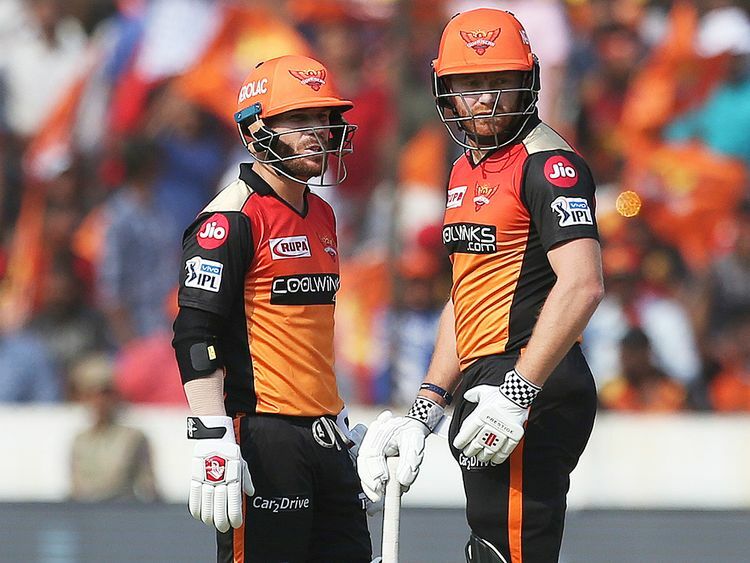 Hyderabad: Jonny Bairstow and David Warner struck whirlwind centuries as Sunrisers Hyderabad cantered to a 118-run victory over Royal Challengers Bangalore in the Indian Premier League (IPL) on Sunday. RCB skipper Virat Kohli’s decision to field first backfired as Sunrisers — without regular captain Kane Williamson — were flying from ball one thanks to Bairstow (114 of 56) and an unbeaten Warner (100 off 55 balls) as the duo recorded the highest IPL-opening wicket partnership of 185 runs. Previously, Kolkata Knight Riders’ Gautam Gambhir and Chris Lynn held the record with a 184-run partnership against Gujarat Lions in the 2017 edition. In reply to Sunrisers’ 231, the RCB gave a poor account of themselves, being bowled out for 113 in 19.5 overs, with the likes of Kohli (3) and AB de Villiers (1) failing to make a mark. Colin de Grandhomme was their top-scorer with a 32-ball 37. For the hosts, Mohammad Nabi returned best figures of 4-11. Bairstow and Warner put on their third successive hundred-run stand this season, a first in IPL history. The Englishman, notching up his maiden IPL ton, was the aggressor as he did not spare any of the visiting bowlers. The Australian, for a change, played second fiddle but once Bairstow was out, upped the ante in his trademark fashion to bring up his fourth IPL hundred as the home team never let their rivals get a grip of things. The pair raced to 59/0 in six overs. Prayas Ray Barman, who became the youngest player at 16 years and 157 days in the tournament, was given his first over and the Bengal leggie conceded just six runs. But in his next three, the teenager saw Bairstow bring up his first IPL hundred off 52 deliveries in the 16th over and hit him to every corner of the ground as he finished with figures of 0/56. Bairstow leapt and punched the air in celebration as the packed house rose in adulation of a masterly innings. There was no stopping Bairstow as he smacked Ray Barman for a six in the very next ball after scoring a hundred and also another to end the over. Vijay Shankar looked to continue the carnage by smacking a six off the first ball he faced but was unlucky to get run out. In the end though, it hardly mattered as a Warner changed gears and got his century in the last over off Mohammed Siraj.